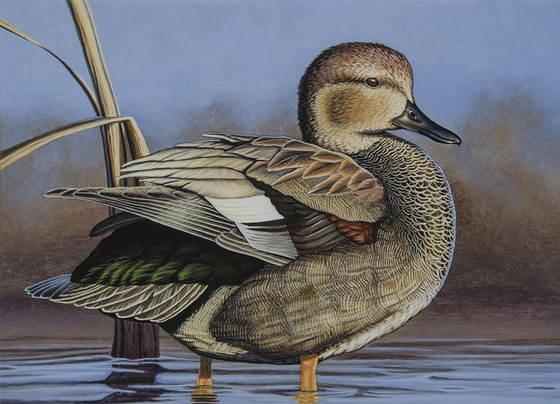 A painting of a gadwall by Cannon Falls artist Jim Caturia will be featured on the 2019 Minnesota Migratory Waterfowl Stamp, after he won the annual stamp contest sponsored by the Department of Natural Resources. This was Caturia’s first time winning the duck stamp contest. The winning painting was selected by judges from among 19 entries. Five entries advanced as finalists that were selected during the Sept. 6 contest. The other finalists were Bradley Hadrava, second place; Thomas Miller, third place; Jake Levisen, fourth place; and Stephen Hamrick, fifth place. The duck stamp contest began in 1977. The DNR offers no prizes for the stamp contest winner, but the winning artist retains the right to reproduce the work. Each year the entries are limited to a predetermined species that breeds or migrates through Minnesota. The eligible species for the 2020 stamp design will be the snow goose. For more on the stamp contests, visit mndnr.gov/stamps.